The Wakefield Estate's Summer Archaeology Institute is a hands-on archaeological excavation at the historic Wakefield Estate in Milton, MA. It is one of only a few programs of its type in the country. The institute is specifically designed for high school and college students interested in learning about local history and archaeology. 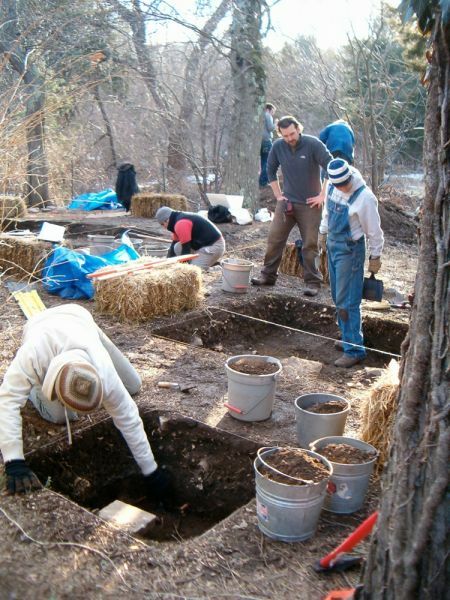 Participants will work side by side with graduate archaeology students from UMass Boston. Each two-week session offers students a hands-on introduction to the field of archaeology through participation in an actual excavation on site at the estate. To read about some of the past discoveries, check the news archive on here on our website. In each two-week session, participants will work closely with archaeologists to conduct survey work and learn how to set up an archaeological dig. 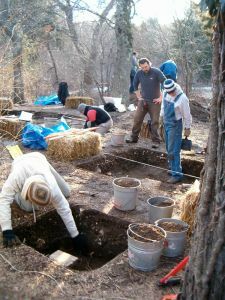 Students will gain excavation experience and the methods and techniques involved in conducting archaeology. Possible field trips and special events include visiting the Boston City Archaeology Lab and meeting specialists from nearby archaeological museums. Participants will also gain experience in identifying artifacts and the behind-the-scenes activities that occur after the fieldwork has been conducted. Willingness to work outdoors in all kinds of weather. Enthusiasm for hard work and getting dirty -- this is an archaeological dig! Commitment to teamwork and respect for others. Scholarships available based on need. Please call 617-333-0924 for more information. To obtain a copy of our application, call 617-333-0924 or click here for a downloadable pdf. Send completed application to address below. Space is limited; applicants will be accepted on a first come first serve basis.